With Paris chefs now competing to out-Brooklyn eachother, it was only a matter of time before New York returned the favor. Toward that end, chefs from The Fat Radish, a “hipstervore haunt” on Manhattan’s Lower East Side, will be cooking a series of pop-up dinners from September 26 to October 2. 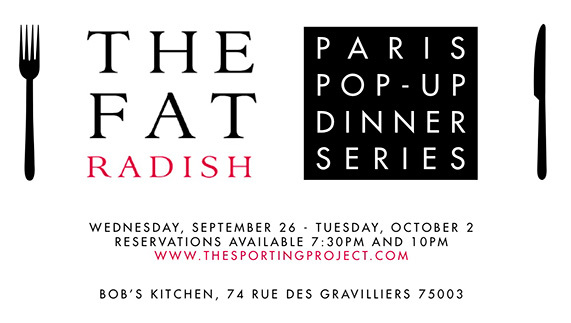 Organized by The Sporting Project, a pair of recent arrivals who used to work in fashion, the pop-up series will take place at Bob’s Kitchen and feature a five-course vegetarian friendly menu with wine pairing and aperitif for 85€. The series was scheduled to coincide with Fashion Week and the majority of tickets have already been snagged by people working in that industry. A few spots remain on Wednesday and Thursday. According to The Sporting Project, “The Fat Radish cuisine does not fall into a particular category rather returns to a way of eating before food was constantly classified. The menu is bound by one philosophy: simple, healthy, delicious dishes created with well-sourced, seasonal ingredients.” That could be anything. My hope is that these dinners will transport us to another place and show us something new. My fear is that they will be very much like eating at Bob’s Kitchen (plus style hounds and wine) for a price that’s greater than the menu at La Dame de Pic. 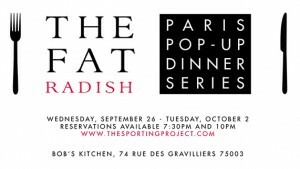 I applaud The Sporting Project for having the courage to launch a food series (another pop-up is planned for Men’s Fashion Week in January) in city that’s so serious about its food. Let’s just hope they came ready to play.